Meatballs are a staple of any Italian household. My grandma used to pack tupperware containers full of them and bring them to my dad–delicious, they were probably more bread than meat. He used to slice them up, sandwich them between two slices of bread with some sort of condiment and warp them in tinfoil to eat on the beach in the summer. My grandma has long stopped making those meatballs and, while they hold a special sun-filled place in my heart, today I wouldn’t be able to enjoy them the same way I did back then. So I’ve come up with a vegan, nutrient-packed alternative (sorry grandma, I know these wouldn’t qualify as meatballs in your book!). 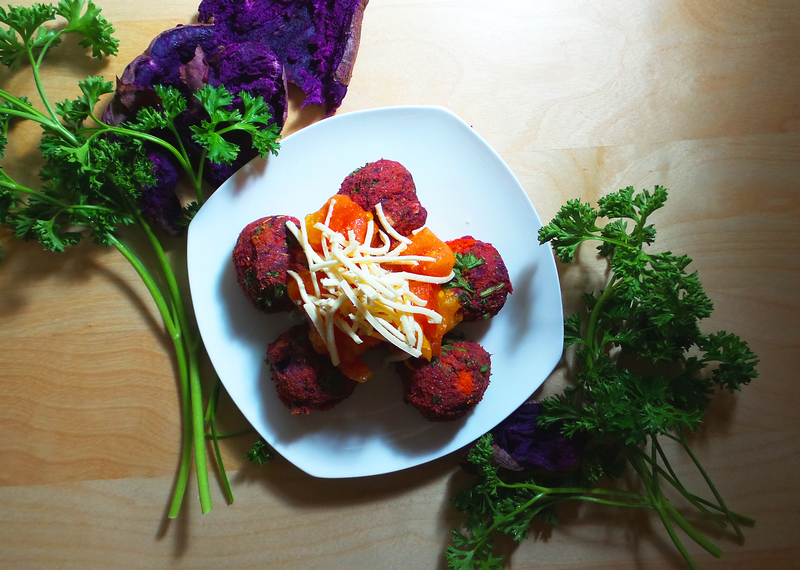 These vegan “meatballs” are made using a Stokes Purple Sweet Potato. The Stokes potato comes from a plant in the same family as morning glories and has a deep purple flesh and skin–both of which intensify in color when cooked. Drier and denser than a normal sweet potato, the Stokes potato lends these “meatballs” their distinctive color and their satiety. Hearty, they stand on their own as a meal–no need to sandwich them in whole wheat bread like my dad used to with my grandma’s meatballs. I like a nice sauce for meatballs, so I prepared these with my cheat sauce: two super ripe heirloom tomatoes, a splash of extra virgin olive oil, salt and pepper mashed together in a bowl–no hours long cooking required (and, as a treat, I threw some vegan cheese on top). You can top them with anything you want though: grainy mustard, tahini, hummus or vegan yogurt all work nicely. The added bonus? Only five of these “meatballs” have approximately 10 grams of protein and all of the Vitamin A you need in a day. For the Meatballs: Add all of the ingredients to a bowl and stir with a fork until well combined. Place the bowl in the freezer for 30 minutes. In the meantime, preheat your oven to 400 degrees and coat a baking sheet with olive oil. Remove the mixture from the freezer and using your hands, roll it into golf ball-sized balls and place them on the baking sheet. Bake for 15 minutes, or until the outsides are crisp. Makes 20 meatballs, 4 servings. This entry was posted in Mains and tagged dairy-free, gluten-free, meatballs, nutritional yeast, purple potato, soy-free, stokes potato, sweet potato, vegan. Bookmark the permalink.